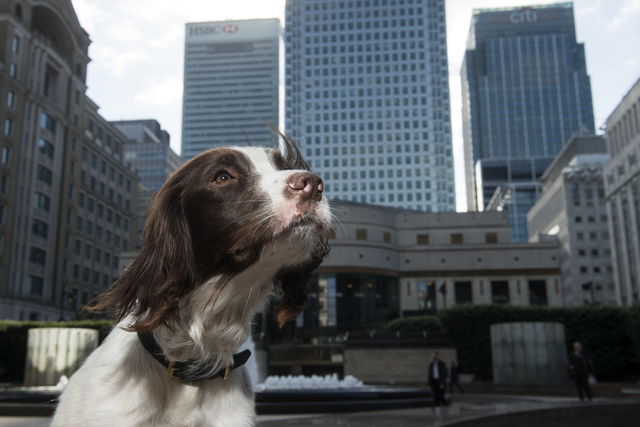 Cute, furry and adorable may not be how you'd describe your stereotypical Canary Wharf worker. However, when you’re talking about the explosive canine team, you can hardly use any other terms. Provided by global security firm ICTS, these dogs mean business — no really, they even have business cards. 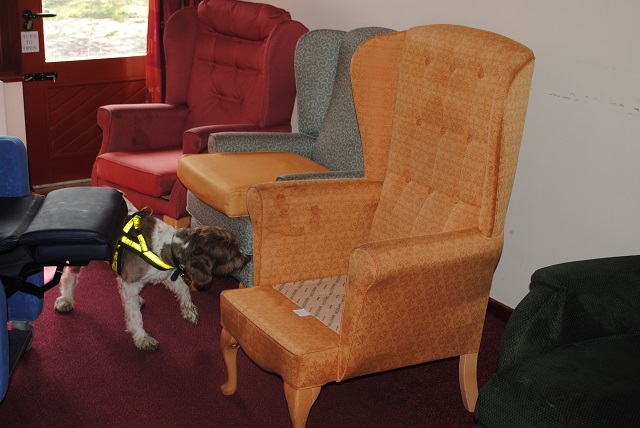 And while they might play a critical role in our safety, they don’t take themselves too seriously; one team of specialist sniffer dogs is even named after characters from Only Fools and Horses. 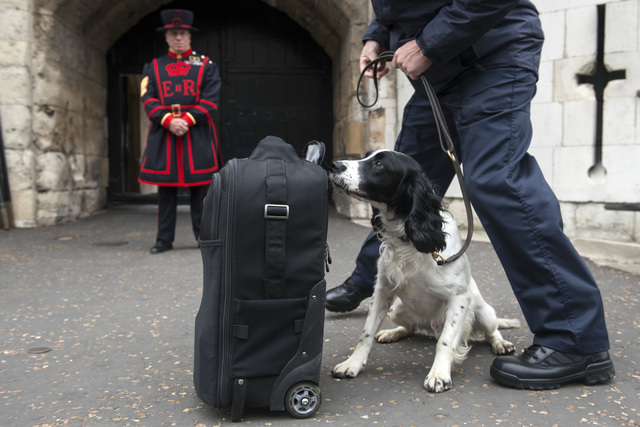 Other parts of London also have their own furry A-teams looking after them — with dog squads guarding our universities, searching for suspicious items at airports and even hunting out bed bugs. Let's meet some of them. The search dogs here have their own exercise companions as well; some of the Yeomen Warders who live here take their dogs for walkies in the moat. Rogue’s dislikes: This fella is so enthusiastic, Dave hasn’t been able to find even one dislike yet. 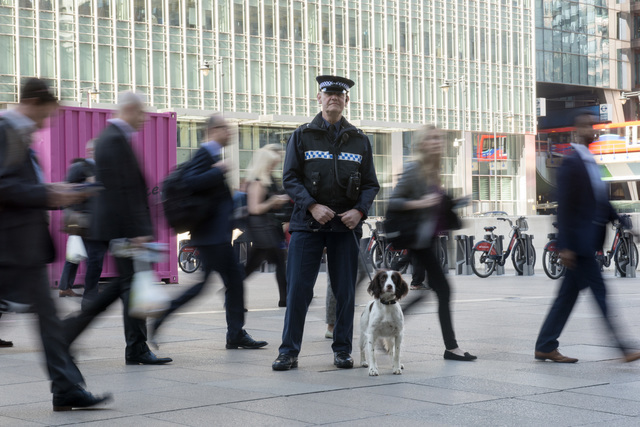 “During a period of heightened terrorist threat level we were requested to supply a number of explosive search dogs to a London Premier League football club as a visible deterrent and to detect any explosives present. 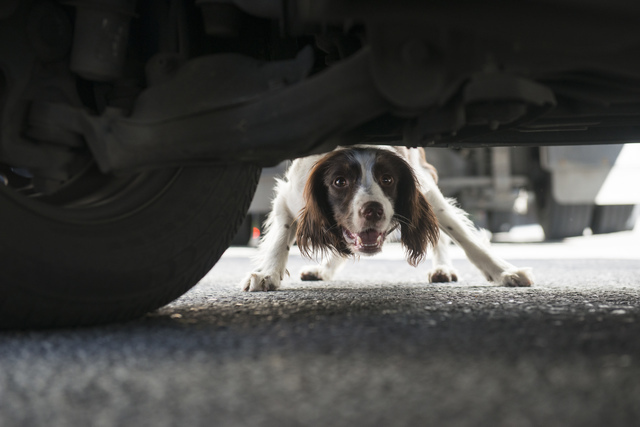 We do not advertise what our dogs are there to do, and of course an explosive search dog looks the same as a drug dog/pyrotechnic detection dog. “While one of the guys was deployed with his dog at the entry turnstiles he noticed one individual making an obvious attempt to avoid him and his dog. 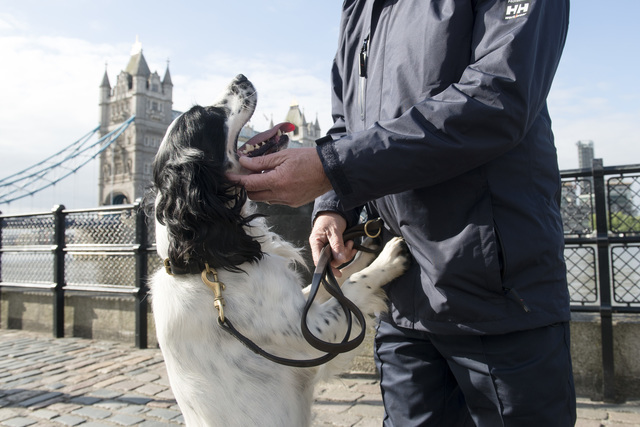 The dog handler alerted an accompanying security officer who carried out a search of the individual and subsequently found a quantity of cocaine. “She lives to work. She may be too keen sometimes though — one time we were doing an exercise among the public and unfortunately she went straight into a woman’s open bag and saw what she thought was her tennis ball — but actually ended up running off with the woman’s apple. “There is a real art to being a dog handler — they know what they’re looking for — when Molly has detected something behind her she just starts to absolutely go." Molly’s likes: It seems the years of working as a gun dog has not escaped her and Gordon says she is a complete workaholic. Molly’s dislikes: Being groomed. “She likes to keep her hair all floppy,” says Gordon. Mark Norman patrols the north London university with his springer spaniels Harry, aged four, and Barney, seven. These are explosive detection dogs and are used for various events including annual graduation ceremonies. They also patrol outside functions hosted at the site, which are diverse in nature but all require a higher level of security. While on deployment at Crufts, Harry took it upon himself to take to the winners' podium while doing a walk-around of the venue. Bedbugs are often found in home furnishings — mainly beds, funnily enough — but they can be hard to detect. Commonly cases emerge when people come back from bed bug hotspots like New York and Spain — the pests hitching a free ride in people's luggage. They can also be transported on second hand furniture and in clothes. “We were puzzled because the first four people who had the presence of bedbugs in their premises hadn’t been out of town, let alone the country. Also the flats were nowhere near each other. “In the very last flat Lizzie indicated positively on a lady's knitting bag and upon examination there were bugs present. After asking some questions it appeared she had been to Spain to visit her son who had thought that they had a problem with mosquito bites, but she had in fact been bitten by bed bugs.